Butterscotch is pretty close to chocolate on my list of favorite dessert flavors. 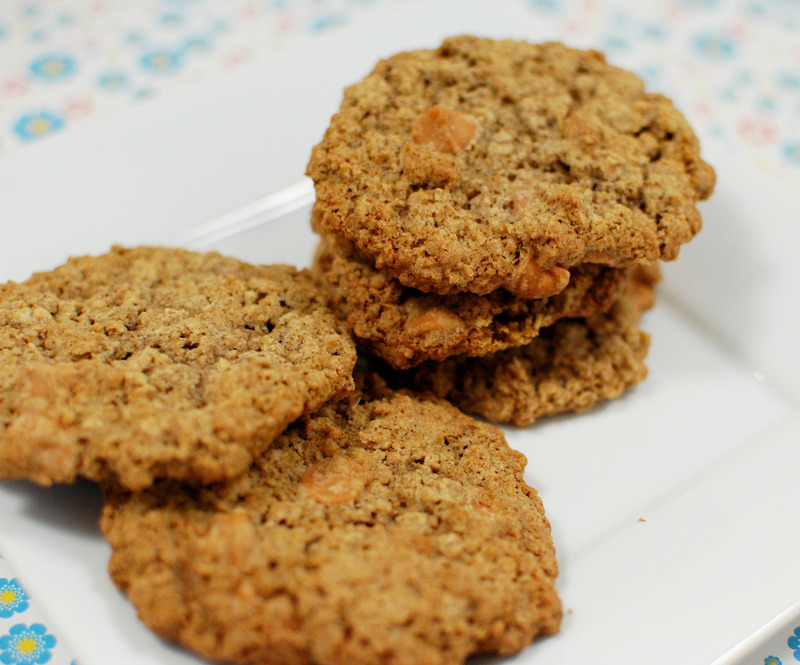 I’m definitely drawn to desserts with butterscotch, and I think it goes really well in oatmeal, so these cookies jumped out at me. I also wanted to try using oat flour in the place of regular flour. I used a food processor to process the oats to the right consistency, then replaced them for the regular flour in the recipe. This worked out quite well, and gave the cookies a great texture and flavor. These were delicious cookies- very chewy, and the butterscotch gave them more depth. Bake for 10-11 minutes, until the edges begin to brown. Let cookies cool on the baking sheet for about 5 minutes, then transfer to a wire rack to cool completely before storing in an airtight container. Every year I get excited when I see strawberries in the grocery store. I’m not really big on fruit desserts, but I do love strawberry shortcake, cupcakes, and ice cream. I saw these cupcakes at the perfect time and decided to make them to celebrate this beautiful warmer weather that we’ve been blessed with! These cupcakes were a pretty standard white cupcake with lemon flavoring, but it was the frosting that made them stand out. This frosting was simply incredible! 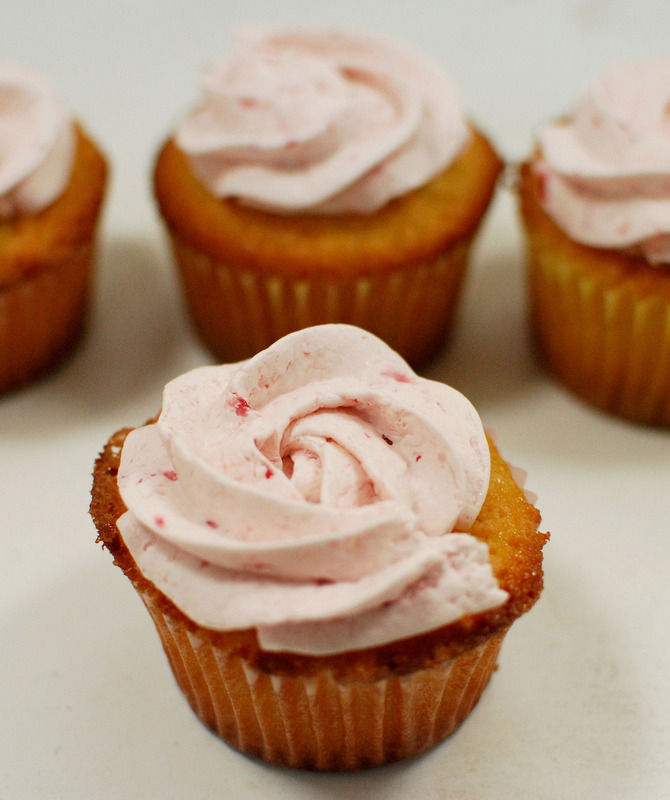 I like pretty much any frosting, but a Swiss buttercream works great in sweets because it’s not overly sweet. It’s more about the creamy, buttery texture. I added an entire carton of strawberries for extra flavor, which was just right for me. David said that this is pretty much his favorite cupcake and he wants me to find even more excuses to make that frosting again! These would be a great dessert to make for a spring cookout or for Mother’s Day- the perfect way to celebrate spring! Preheat oven to 325 degrees. Prepare muffin tin by either spraying with baking spray or lining with paper liners (my preferred method). Whisk flour, baking powder and salt together and set aside. Cream butter and sugar on a high until pale, light, and fluffy (about 5 minutes). Add eggs one at a time, mixing thoroughly before adding the next one. Add lemon zest, lemon juice, and vanilla. Turn mixer to the low, and add the dry ingredients in three batches, alternating with the buttermilk in two batches. Mix only until just incorporated. Fill each muffin cup ~3/4 full. Bake for 25 minutes or until a skewer shows only moist crumbs attached, rotating the pans at the halfway point. Allow cupcakes to cool completely in the pans before removing. Place the stand mixer bowl over a simmering pot of water (the bottom of the bowl should not touch the water). Whisk the sugar and egg whites until the sugar is dissolved and the mixture registers 160 degrees with a candy thermometer. Place bowl on the stand mixer fitted with the whisk attachment and whisk on high speed until the mixture is cool and holds stiff, glossy peaks (approximately 10 minutes). Change to the paddle attachment and beat in one tablespoon of butter at a time on medium. The mixture might appear curdled but keep going, it will pull back together. Add lemon juice, strawberry puree, and vanilla. Increase speed to high and beat until the frosting reincorporates and is smooth and fluffy (this will take about 10 minutes). Oh, how I love ice cream! I’ve never made an ice cream like this one, so I was excited to see how it would turn out. 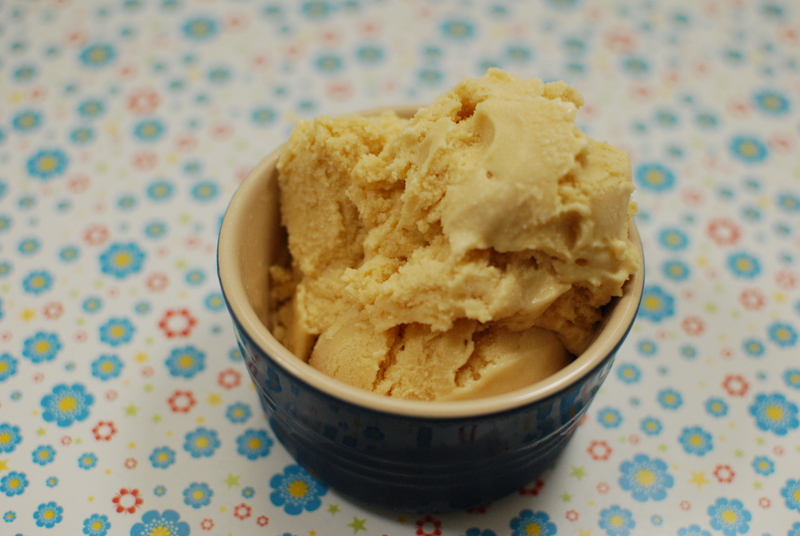 It’s an egg-based ice cream, which I’ve gotten very comfortable with making. I like egg-based recipes because of their rich, creamy texture. This ice cream starts off very similar to the way you would go about making caramel, so I was not surprised with its taste. It has a sweet, caramel flavor- I would even compare it to dulce de leche. Usually I’m all about add-ins for ice cream, but I think this one is perfect on its own. You can view the recipe on Becky’s blog, and visit the TWD blog to see how everyone else’s turned out. I recently made Almond Joy Ice Cream, and Katrina left a comment on my blog saying that she just posted these brownies earlier that week. I’m not sure how I missed her post, but I’m sure glad she pointed it out to me! 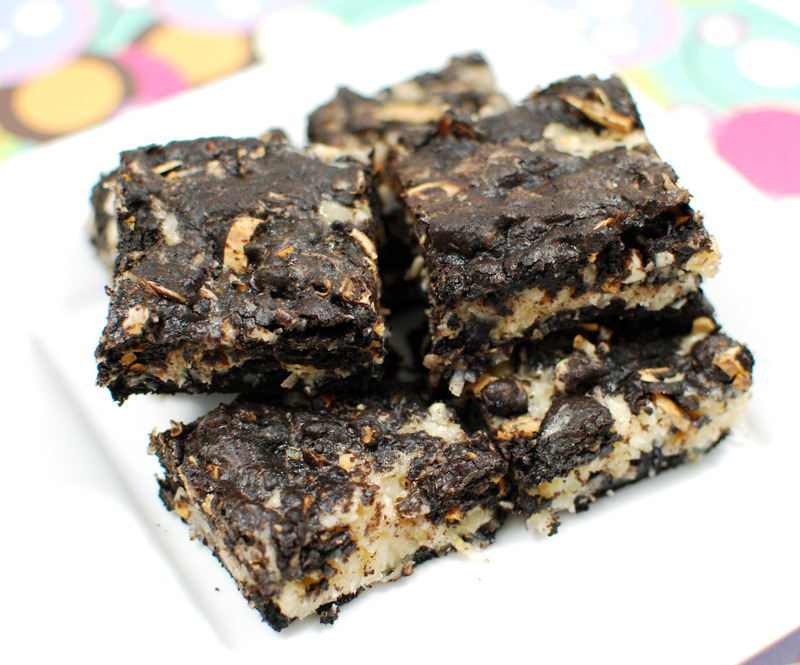 I said in my previous post that I love Almond Joy candy bars, but the flavor is even better in these brownies. The best part about these brownies for me was that they are gluten free, thanks to the use of coconut flour. It’s fine to use regular flour if you don’t care about them being gluten free, but I would recommend using coconut flour if you can because it gives the brownies a stronger flavor. These brownies were only slightly more complicated than regular brownies to make because you have the coconut layer in between. My only issue was that there wasn’t really enough brownie batter for both a bottom and top layer, so next time (and you better believe I’m making these again!) I will increase the brownie batter. I reflected those changes below. These are the perfect brownies to enjoy with some ice cream, so when you make them, be sure to make some Almond Joy Ice Cream to pair them together! Preheat oven to 325 degrees. Line an 8×8-inch square baking pan with foil, and spray foil lightly with baking spray. Melt butter in medium saucepan over medium heat. Remove from heat, and whisk together well. Let stand 3 minutes. Whisk in eggs one at a time, then add sugar and vanilla and almond extracts. Fold in salt and flour and stir until ingredients disappear into batter. Spread half the batter evenly in pan. Combine coconut, salt, and sweetened condensed milk in a bowl. Spread dollops of coconut mixture over the brownie batter. Sprinkle chopped almonds over coconut mixture. Spread remaining brownie batter over coconut mixture. Smooth carefully with a knife. Bake 20-25 minutes, or until toothpick inserted in center comes out with a few moist crumbs attached. Let cool on a cooling rack, then chill in the refrigerator for at least 2 hours. Cut into squares. I love mix-ins. It’s my favorite part of a brownie, cookie, ice cream, or pretty much any other treat. So, it should come as no surprise that I liked these. 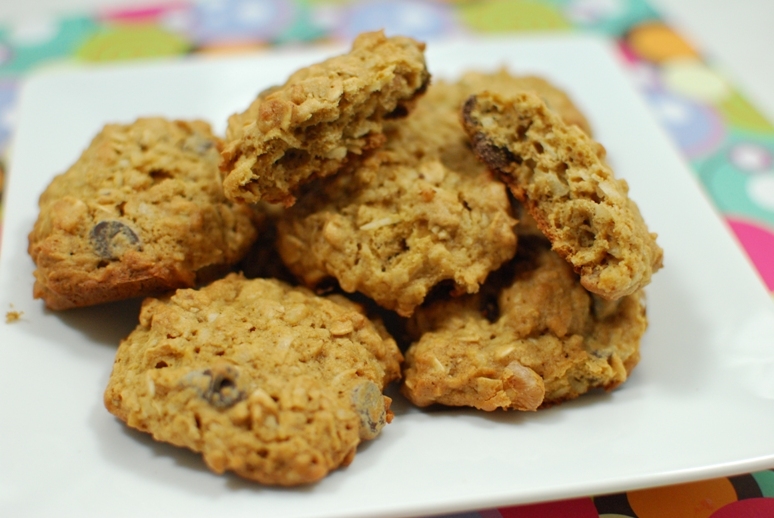 These cookies are so full of mix-ins, and so adaptable to your tastes. I used walnuts, coconuts, and chocolate chips, but wished I had used some raisins too. They would also be good with butterscotch chips, white chocolate chips, craisins, pecans, M&Ms…the possibilities are endless. These had such fabulous texture too- they remained soft and chewy after baking, and were able to handle all the added ingredients. They were sweet, but not too sweet to where you couldn’t enjoy the cookie. You really can’t go wrong with these! Mary chose the recipe, which you can find on her blog, and you can visit the TWD blog so see everyone’s variations. EDIT: I wanted to add that I used all butter and it worked out just fine. I rarely have shortening on hand! Recently, we had a rainy day and I thought it would be nice to sit down to some comfort food. I found a recipe for beef stew, which I had been wanting to make, but this one had a Mexican spin on it. I was curious to see how the Mexican flavors played out in the recipe, so I decided to try it. Many beef stews take a while to cook. This one requires one hour of simmering time, but the rest of the preparation is pretty quick, so you could still make it on a weeknight (if you prep the night before, it would be even quicker!). I just love the way this smelled while it was cooking. The simmering time definitely built up the anticipation for this, but it was worth it! This was such a delicious dinner. I loved how all the flavors came together. It had some heat, but it wasn’t too spicy. It was a great spin on classic beef stew, and something I will make again for sure! The recipe said that you can serve this with warm flour tortillas, which I think would be delicious, though we ate it as is. Heat the oil in a large skillet over high heat. Add the meat and brown for 10 minutes. Do not drain the liquid. Add the bell pepper, onion, potatoes, garlic, chile, and tomatoes, and continue cooking for 10 minutes. Add the spices, the tomato sauce, and 2 cups water. Reduce heat to low, cover and simmer for 1 hour or until the meat is very tender. Add more water as required. Season to taste. In a small cup combine 3 tablespoons cooking liquid with the flour. Stir to remove any lumps, then add to the carne guisada, mixing well until evenly thickened. We recently attended a potluck event and I signed up to bring both an appetizer and a dessert. David and I had been talking about how much fun it would be to make our own potato skins, so I thought this would be the perfect dish to take along. 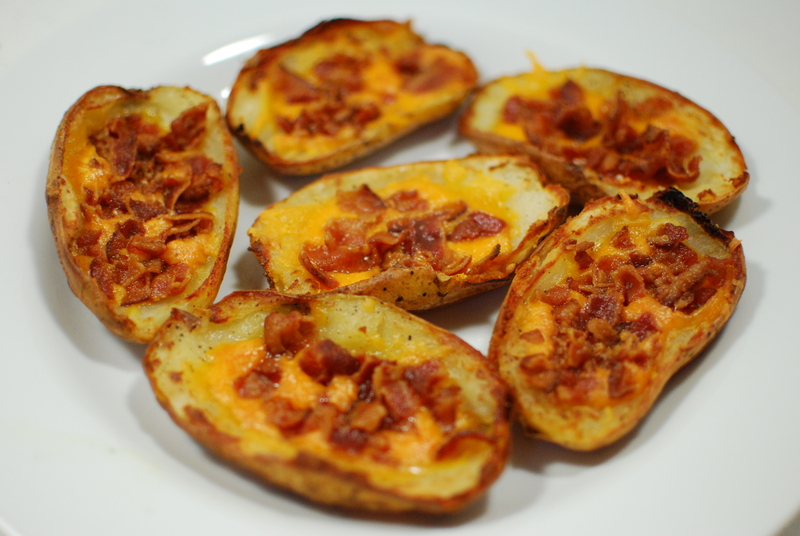 It’s hard to go wrong with potato skins. You get the slightly crispy outer shell of a potato and you get to fill it with whatever you want. It’s like getting the perfect bit of a baked potato every time. I filled them with the obvious choices- cheese and bacon! These were also incredibly simple to make. I baked and prepped the potatoes early in the day and right before leaving, I popped them in the oven to broil for a few minutes so they would be fresh when served. These were a big hit. David was definitely satisfied at this version of homemade potato skins and we will make it a point to have them around when football season rolls around this fall! Preheat oven to 400 degrees. Poke the top of each potato with a fork and place on a baking sheet. Bake for 60-70 minutes. Remove from oven and let cool for about 15 minutes. Cook bacon on stove over low heat, about 10 minutes. Remove, drain on paper towels, then crumble into small pieces. Once potatoes are cool, cut in half lengthwise, so that each potato will yield 2 skins. Carefully scoop out center of the potato, while still leaving some potato in the boat. Heat broiler to high. Brush melted butter on the inside and outside of the potatoes. Season each side with salt and pepper. Place under the broiler for 8-10 minutes to allow the insides to get crispy. Remove from oven and place cheese and bacon on each skin. Return to the broiler for 3 to 4 minutes, or until cheese is melted and bubbly. Remove from oven and serve.